The e cigarette vaporizer Aerotank v2 and the 2200 twist battery, has to be one of the best combinations of clearomizers and batteries to co-exist in a kit. The pairing of the great tasting dual coiled Aerotank clearomizer and the power of the 2200 twist battery equal a fantastic vaping experience. To charge your battery, simply screw the neck of the battery into your usb with cord charger. Because the 2200 twist has such a huge mAh, when brought all the way down to its red indicator it will take about 5 and ½ hours to 6 hours to completely charge back up. 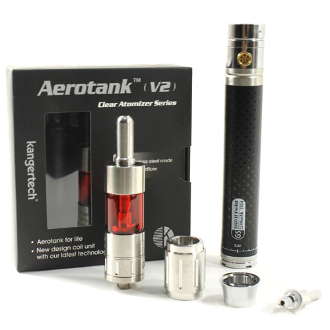 The Aerotank V2 is an advanced piece of equipment manufactured by the electronic cigarette industry powerhouse KangerTech. Designed to produce astonishing amounts of vapor, this dual coil clearomizer is the perfect counterpart to the Variable Voltage 2200mAh Twist battery. Composed of stainless steel and Pyrex glass the Aerotank is as attractive as it is efficient. Along with its exceptional vapor production capabilities the Aerotank is fitted with an air control base with 5 airflow holes to further customize the perfect e cigarette vaporizer hit. Don’t be intimidated by the Aerotank’s high tech appeal as it is a breeze to use. As a bottom filling clearomizer just twist off the base of the clearomizer for access to the inside of the clearomizer as well as the coil attached to the base itself. The entire clearomizer is able to be disassembled and cleaned allowing you to prolong the use of this spectacular kit. Along with all the bells and whistles that come with the both the battery and clearomizer, the e cigarette vaporizer Aerotank v2 2200mAh Twist Battery Kit comes with a couple extras to get you started on your path with this amazing upgraded kit. The kit includes two 10ml bottles of liquid, a spare metal shell for your Aerotank, two extra coils, a USB Charger, a wall port, and a carrying case.